Accra, Feb. 3, GNA - President John Agyekum Kufuor on Thursday exhorted Ghanaians to exercise a sense of responsibility as they enjoyed the freedoms of association and expression. Delivering his State of the Nation Address to Parliament in Accra, he said the Government had put in place the necessary legislative and administrative instruments to create the proper environment for the entrenchment of good governance. He said in addition to legislations recently enacted, the Right to Information Bill, which guaranteed the citizens' right to relevant public information and the Whistle Blowers Bill would bring the fight against corruption and graft to a new level. "The passage of these bills will be a major priority this year and it is hoped that as individuals enjoy the constitutionally enshrined freedoms of association and expression, they should also exercise a sense of responsibility." Elaborating on Good Governance, his Government's third priority in the second term, he said this was the guiding principle, which had underpinned all the policies of his Government. President Kufuor recalled that last year, 28 new district assemblies were created saying the decentralisation process was to carry democracy to the doorsteps of the people and to deepen good governance by involving the citizenry at all levels of decision-making. He noted that the National Policy on Gender and Children was also launched last year to ensure the mainstreaming of gender concerns in national development. 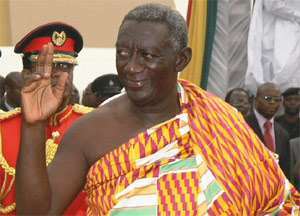 President Kufuor said constitutional agencies like Commission On Human Rights and Administrative Justice (CHRAJ), National Commission on Civic Education (NCCE) and National Media Commission (NMC) would receive increased budgetary support as the economy improved to enable them to become more efficient in their assignments. "These measures, Mr Speaker, have created an environment, which provides the backdrop of an evolving and self-confident society, a society within which the policies of Chapter Two (his second term) can be implemented." President Kufuor said Ghanaians were proud of the peace and quiet in the country and they had contributed in various ways in maintaining this peaceful environment. "But we must also remember that a major deterrent to misrule and social misbehaviour is effective law enforcement. "Government will, therefore, continue the policies, which have empowered the law enforcement agencies to work effectively to keep the current peace and security of the nation." In this regard, President Kufuor said, the equipment and strength of the Police Service would be enhanced steadily, in addition to the training and re-training of Police personnel. Early warning systems on internal conflicts were being developed, he said, adding that coordination among the security agencies was being improved to promote optimal utilisation of available resources.